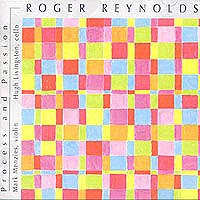 Roger Reynolds has been going about his art for many decades. By now he is one of the premiere living composers in the United States today. Through recordings he is especially known for chamber orchestra and vocal works. Not much of his more intimate chamber music has become widely available. The gap has been nicely bridged in part lately by the three-work program on the CD Passion and Process (Pogus 21032-2). The three works are "Kokora" (1992) for violin, "Focus a beam, emptied of thinking, outward. . . " (1989) for cello, and "Process and Passion" (2002) for violin and cello. Performing the demanding parts are Mark Menzies, violin, and Hugh Livingston, cello. There are two disks in the set. The first comprises the performances in standard two-channel sound; the second disk involves a contrasting mix into six channels, which are then binaurally converted so that the listener can hear a simulated six-way presentation (though this latter mix can be experienced properly only through headphones). This is chamber music in the fully modern zone: wide intervalic leaps, complex abstracted rhythmic landscapes, widely expanded tonality or atonality, and a virtuoso set of string articulations. Maestros Menzies and Livingston do an admirable, rather extraordinary job with their parts. This is Roger Reynolds on the turf you would expect him to occupy. He does so quite successfully with three scores that take close listenings to appreciate but come through with memorable high modernist string music in an intimate setting. I appreciate the binaural versions but am not one to listen for any length of time with headphones (unless I am walking to music), so the expanded sound staging was slightly lost on me in my restless run-through of that disk. The music is demanding but ultimately very satisfying. It is in every way a welcome addition to the Reynolds discography and will only further enhance his already considerable reputation. Anyone in touch with the modernist style will no doubt find in these performances a kind of manna for their modern-hungry ears. It could be said that the impact of the first two decades ('50s-'60s) of American electronic/electro-acoustic music has not been as strong as the work produced in Europe during that period. Sure, Babbit, Ussachevsky, Mimaroglu and a few other composers associated with the Columbia-Princeton Electronic Music Center and Subotnick out of San Francisco made a strong impression in their day and continue to be admired now. True also that Edgard Varese's brief but important foray into the field and John Cage's pioneering collages and subsequent work remain important influences on the avant garde scene. But there were many composers active then that are not as well-remembered now, many worthy of our attention. Kenneth Gaburo (1926-1993) is one. So it is especially welcome that an anthology of ten of his tape works covering the period of 1964-1992 have been issued/reissued as Tape Play (Pogus 21020-2). 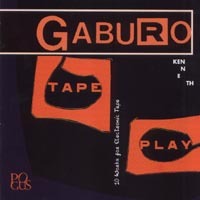 Gaburo liked to mix comparatively unaltered instrumental and vocal sounds in with electronically generated ones. Most of the time he tended toward more of a "chamber" than an "orchestral" electronic palette. He had a sense of humor sometimes lacking in the electronic music of the period and a somewhat quirky sense of dramatics. All this combined served to distinguish him as somewhat untypical. The ten works represented in the volume at hand are sequenced in more or less chronological order. The earliest works, some originally released on a Nonesuch LP at the time, have less of a virtuoso feel to them than some of the later works. They are perhaps a bit more conversational and slightly casual compared to what followed. "Fat Mille's Lament" (1965), for example, combines an altered vocal loop with clouds of rapid high-pitched glass-bell sounds, then takes a jazz orchestra snippet and modifies it by doubling for a moment, only to fade away to leave an open space that is again filled with a short reprise of the loop and cloud. "Re-Run" (1983) uses rapid-fire melanges of single-timbred sounds. It's a good example of how later works seem a bit more developmental; they generate unified discourse from single-idea kernels much of the time, and may combine abstract spoken word dialogues with electronic soundscapes. You can hear this in "Mouth Piece II" (1992), or "Kyrie" (with Henri Chopin)(1974) and its familiar children's nonsense rhyme-song incanted in deadpanned seriousness while a mystical drone of sustained altered voices sounds in the background. Kenneth Gaburo has a timeless presence in these works. The fact that he tended to avoid the sort of serial syntax in favor then and his attention to ambiance gives him a vibe more in common with the electro-acoustic music in vogue today than some of the more methodologically minded composers active at the time. And the music continues to hold fascination. True, he may not be at the very pinnacle of achievement for his era. Nevertheless it is good to hear these pieces again and/or (at least for me, some) for the first time. They keep their interest and most certainly don't repeat themselves. He was ever imaginative and puckish. And perhaps easier than some composers of the day to grasp by those uninitiated in avant fare, since he tended not to seek out much in the way of strident dissonance or complex noise. Recommended, especially for the avant completist. What music is for absolutely everybody? Some children's collection of songs about farm animals, perhaps, but then you have to be five and you still might not like it. And so the same might apply in different ways for Di Sheyne Milnerin (Nimbis Alliance 6191). 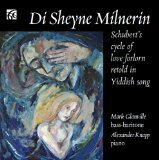 The album comprises a recital for Mark Glanville, bass-baritone, and Alexander Knapp, accompanying on piano, of a cycle of Yiddish art songs from the 19th-20th centuries. The music parallels Schubert's Die schone Mullerin, in that both song cycles tell the story of unrequited love. There is even a Yiddish lyric version of one of the songs from Schubert's cycle. If you know Yiddish, all the better. If you do not, there is still much to appreciate. Glanville put together and sequenced the Yiddish cycle, choosing songs of Euro-Jewish composers both relatively known and more obscure. It is art song with some more in a typically minor key-Yiddish melodic mode than others. But all have interest. Glanville and Knapp do a spirited job with the songs and many have great appeal if you hear them a number of times. It is a boon to those interested in a genre that does not always get much attention. Others may find it less essential. I found plenty to like here. Mezzo-Soprano Lorraine Hunt Lieberson left us early, mid-last decade, a victim of cancer. As with any artist of her stature there is no replacing her. But at least there are her recordings. A new one has surfaced, with her singing Bach's cantata Mein Herze schwimmt im Blut, BWV 199, live in 2003 with the Los Angeles Chamber Orchestra under Jeffrey Kahane. The CD is simply titled Lorraine (Yarlung 96298). What to say? 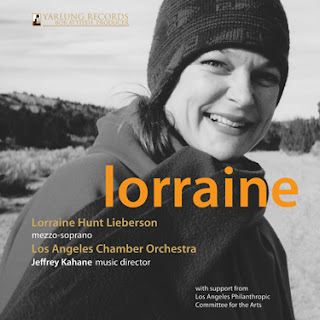 Lorraine sounds unearthly, the Bach cantata is very moving and beautiful, the oboe de amore part nicely played by Allan Vogel, the viola solo likewise by Roland Kato. It is toward the end of Lorraine's life, in effect a kind of goodbye, though I don't imagine she was thinking of us here in 2013 as she sung. But here we are anyway. The orchestra does an extraordinarily quicktime version of the Brandenberg No. 4 by way of introduction. It's taken at a faster clip than I've ever heard and as a result Margaret Batjer's solo violin part is a pyrotechnical feat of large proportions. It's exhilarating and a testament to the spirit and accuracy of the orchestra. But the disk belongs in the end to Lorraine. Her artistry is ravishing. Someone like Iva Bittova is beyond category. She is not easily pigeonholed. In a search-engine-land medium where categorization is the first criteria, she does not easily fit. 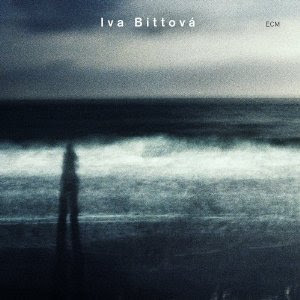 For her latest album, titled simply Iva Bittova (ECM B0018081-02), I decided to include her in the modern classical blog, because her music has compositional structure. The album is the first under her own name. On the surface it is a simple matter. Iva sings, accompanied or unaccompanied by her violin and kalimba playing. The pieces have folk purity yet come across as contemporary music. Partly that has to do with how the vocals and violin interact and what is going on with them musically, of course. It is the sort of spatially resonant music that ECM and Manfred Eicher love to place in a sound stage, and indeed the music glows in that classic ECM manner. The strains of her native Moravia and the Slovak folk tradition in general most definitely have an important place as foundations for Iva's music. Yet her own sense of concertizing gives it a different life. The "Fragments I-XII" title is modest. In a way this is a concerted piece for Iva alone. An interrelated twelve-part soliloquy from Iva to you. Lovely, very personal, and very direct. You want something with plenty of room in it and filled with a folksy earthiness yet also an inherent musical structuration (is that a word?)? You'll find it here. Very comfortably. Canadian composer Ann Southam passed away in November 2010. Five completed piano pieces were found in her home in manuscript. It is these works that form the subject of the new CD 5 (Centrediscs 19113). Pianist Eve Egoyan gives us her sympathetic readings of the works, which are "Returnings II in B flat," "Returnings in A flat," and three untitled works, in G, A flat and B flat, respectively. The works are similar, as I understand it, to the Returnings pieces published in her lifetime. Each one is of a piece, at a leisurely pace, legato, unfolding slowly and hypnotically. They are of a mesmerizing minimalist sort. A chord, a note in the bass and several notes in the mid-range, for example, alternate slowly; perhaps several additional chords are introduced later. Each work proceeds in a similar manner for around 15 minutes. Every piece is a distinct part of the overall set, like Carl Andre's tile works were each a part of a series, yet differed slightly. It is a minimalism genetically related to Satie and Cage but ultimately all Southam's own. The music whiles its way into your life in a sort of impressionistic manner, like the babbling of a nearby brook. I took to the works right away and find them continually welcome in my listening life thus far. Southam is like no other and that these are in effect her goodbye to us on this earth is quite affecting. Like conceptual art and modern image art, the best avant garde works of music may not only provide a sound world of unusual dimensions and provenance, they also may make you think. Like a Zen rock garden, there are often a finite set of elements, perhaps in various states of transformation, and your experience of them is heightened by reflection on what you are hearing. The actual hearing, you may become aware, is a process, not at all-together synchronic singularity. John Cage was a master of making you expand how you approached your sensuous world in this way. Dogs barking, ambient room noise, or any matter of elements Cage manipulated usually had a conceptual component that was more than it might initially appear. 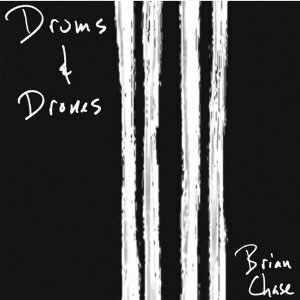 Brian Chase and his work, as heard in Drums and Drones (Pogus 21070-2), has that about it. There are ten segments that flow together as different aspects of the overall matrix. Chase, drummer for the Yeah-Yeah-Yeahs, close-miked various drums tuned to specific pitches and then processed those tones through a computer and a set of loudspeakers. The idea is to emphasize the sound and its segments of the overtone series through filtering (to explore just intonation in part) then to further subject those sounds when desired to transformations by causing and manipulating feedback drones that occur as the drum head interacts with the loudspeakers. Each segment is its own sound universe, the drum being a carrier of percussive and sustained tone here but not as much of rhythm. The first disk is a CD containing the sound works only; the second disk is a DVD with the 10 segments augmented by corresponding abstract animations by Ursula Scherrer and Eric Z. In the end you are led into contemplation of the sound of drums and the nature of that sound, what it is in microcosm and what it may be transformed into with electronic manipulation. A single tone-sound with its overtone series is always a universe unto itself. The pieces expand our awareness of this inner world as they also provide a kind of fulcrum for meditation on the nature of sound. Or at least that's what I ended up experiencing. The animations have a sameness-in-change that perfectly synchronizes with the sound-music. I found the color visuals a refreshing change after a number of studies in black and white. They certainly transfer in visual terms the ideation of the music. The music takes some getting into and how much you like it may depend on how deeply you have delved into minimal avant garde and the abstract sound sculptures of works that have come before. Some may find it less "interesting" than what they are used to. Give the sound time to unfold and hear these segments a number of times and you will probably (like me) fall into the spell that the sounds cast over the sympathetic ear. It's either remarkable or boring, depending on how much you put into it. So of course is a Zen rock garden. Brian Chase has created something unexpected, no matter how it affects you. That is far from easy in these times. 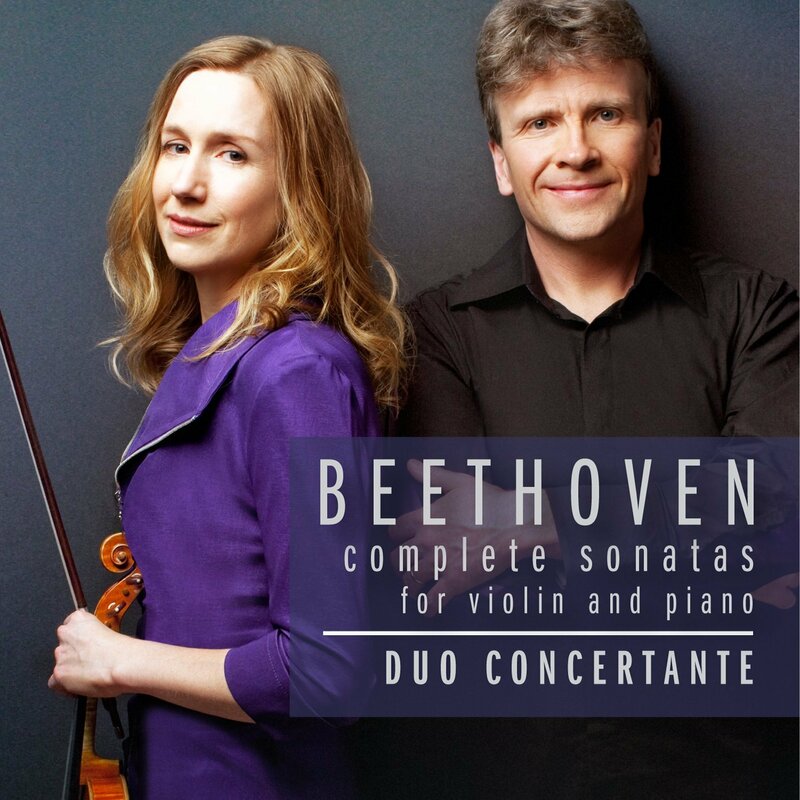 Beethoven's sonatas for violin and piano are a musically rich subset of his chamber output. They may not have the extraordinary breadth and moving depth of his string quartets, they may not have behind them the bracingly expressive tradition heard in recordings of the cello sonatas from Casals and Rostropovich, or the moving emotional peaks and valleys and the fire of the piano sonatas. But they have a balanced eloquence and thematic charm unmatched by contemporary works of like instrumentation from the era. 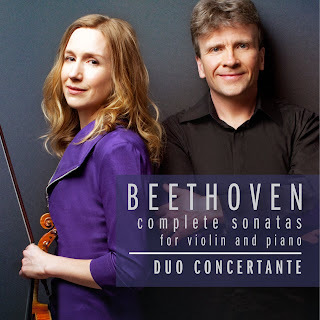 If you do not have the complete Sonatas for Violin and Piano you might do well to consider a new edition out on a 3-CD set by Duo Concertante (Marquis 774718151728), a young and vibrant Canadian pairing of Nancy Dahn, violin, and Timothy Steeves, piano. The duo have played the full cycle together regularly since their formation several years ago. Their affinity for the works is quite apparent as you listen. They give a measured passion to the music that is not overblown but tender and dynamic in turns. They create an elegant balance, a classical parity between the two instruments and their expressive performances have a refreshing clarity and feel for the symmetry of the music that is a joyous experience to hear. Nowhere have I heard a more detailed refinement in these sonatas. There is as much put into the lesser known works as those more well known. Get this version and you'll have renditions that do full justice to the music as Beethoven conceived of it. Duo Concertante do a wonderful job. Mozart's Requiem has been the object of myth, of debate and of devoted admiration since he left it unfinished at his death. The completed version that has come down to us was extended and orchestrated by several hands, including his student Franz Xaver Sussmayr. Yet alternate realizations are always possible, since every movement at Mozart's death had degrees of completion and no hard and fast rule dictates exactly how it should be fleshed out. 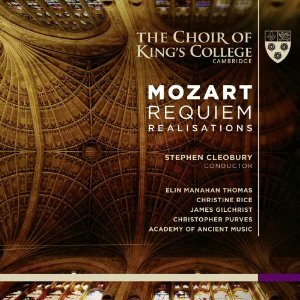 The Choir of King's College, Cambridge, with soloists and the Academy of Ancient Music, all under the direction of Stephen Cleobury, have given us what you might call a critical edition CD (King's College KGS 0002): a fine performance of the Sussmayr version and then alternate versions of five of the movements as realized by various composer-musicologists. A second disk provides a fine audio documentary written by Mozart scholar Cliff Eisen, discussing the facts behind the work as it has come down to us, its antecedents, the mythology surrounding the work, its reception over time and what exactly has been involved in the various realizations. Musical examples make all quite reasonably plain and clear. It all comes together in a SACD hybrid format, and the sound is remarkable in itself. The standard version as performed in the set is perhaps the loveliest I have had the pleasure to hear. There may be versions more stirring, more Beethovianly bombastic, but none more haunting. The choir is heavenly, the orchestra a bit smaller and less prominent than with the bombast editions, but as a result more subtle, and the soloists are top notch. Having the five alternate realizations is revelatory and moving. Some movements are more dramatically transformed, others less obviously so, but all are very nice to have indeed. The documentary disk is a model of its kind, thorough, incisive and insightful. In short this version is a must-have for anyone with more than a passing interest in Mozart's final work. Its haunting performance will transport you; its attention to critical detail will satisfy and educate you. Do not miss it. Sparky Davis composes music that some early modern American artists tended to go toward in the heydays of Harris, Hanson and Barber. It has a residue of romantic expressiveness, it is tonal but extended, and the linear working out of thematic melodic motives is especially pronounced. 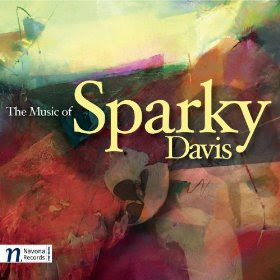 There's an entire disk of his music out, understandably called The Music of Sparky Davis (Navona 5897). Two works are for orchestra, one for solo piano. The Moravian Philharmonic Orchestra under Vit Micka or Petr Vronsky do a respectable job fleshing out the particulars of the symphonic works. Karolina Rojan lets us feel and appreciate the expressive thrust of the Fantasy Sonata. "...and Our Last Waltz," and "Symphony in Bb" are distinguished by inventive thematic material developed in ways that have almost a conversational-poetic logic. The orchestration has a classic-romantic quality and the music flows effortlessly. The piano sonata has an expressive modern-romantic chromatic-tonal elan to it. Again the motival development and flow make for an enriched and rewarding listening experience. Sparky Davis may be a stubborn individualist, in that he thrives and works within a style that perhaps looks more backward than it upsets musical apple carts ahead. But he is very plausable and lucid in the universe he chooses to inhabit. And so one comes away from the experience with a pleasure that makes one wish to hear the music again. Thank you Sparky for that. 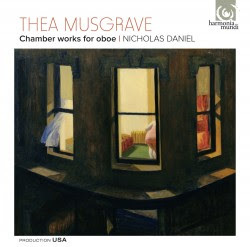 Chamber music for oboe in the modern camp is not precisely a commonplace, at least on disk, but Thea Musgrave's work in this realm is extensive and well worth hearing. Oboist Nicholas Daniel skillfully devotes himself to a full disk of it on the recent Chamber Works for Oboe (Harmonia Mundi 907568). The music was written over a wide period of time, 1960-2009, but reflects a consistency of inspiration and craft on the composer's part. Her most recent works here were written specifically for Richard Daniel: "Cantilena," "Night Windows," "Take Two Oboes" and an arrangement of "Threnody" for cor anglais. Other winds, chamber ensemble, piano, and electronics combine with Nicholas's beautiful playing, with a sound ravishing, expressive and satisfyingly precise. Perhaps this may not be a recital that would ordinarily be on your list of must haves--but it gives listeners a full, beautifully wrought program, a testament to the brilliance of Musgrave and Daniel. Recommended. The technology of digital editing has changed the way composer-musicians operate in a huge way. 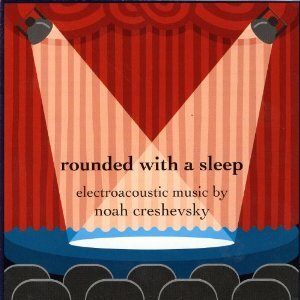 To get the musical results Noah Creshevsky does in Rounded with a Sleep (Pogus 21063-2) would probably have taken years with the old analog splicing block, razor blade and magnetic tape method used in Cromagnon times (even in the '60s-'70s). But the advent of samplers and the digital workstation has changed all of that. Regardless of method, however, what doesn't change is the musical quality of the mind. Maestro Creshevsky makes superior sound poems no matter what means he uses to get them. The lively Pogus disk contains seven works, most all utilizing sound segments of avant classical instruments and vocalists in performance, sampled and arranged into vitally alive collages. One work features vocals only. What Creshevsky looks to create are horizontally dense thickets of timbrally fascinating juxtapositions--more note oriented that noise or sound oriented. What he gives us are electroacoustic works that for the most part retain instrument performance purity, chopped and resituated in ways that provide a superhuman sort of contrapuntal mix. It works extraordinarily well and bears many repeated listens. For this is full-fledged composition more than experimentation. It is music of importance and beautiful to hear as well. Listen to it and you'll be rocketed to interesting places. Leo Brouwer is undoubtedly Cuba's most well-known and internationally acclaimed living composer. Where the contemporary classical Spanish-Latin guitar tradition is concerned he has done much to extend and modernize it. 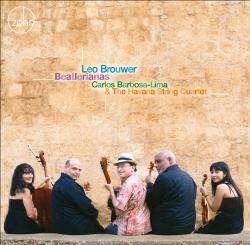 Both guitarist Carlos Barboa-Lima and the Havana String Quartet have had plenty of accolades showered upon them as well, deservedly. Put the three together for the first time, and you might expect something very good. And indeed that is what you get on the disk Beatlerianas (Zoho 201304) a spring release that somehow does justice to the season by providing some beautifully wrought music. The suite "Beatleriana" sets things off on an auspicious path by giving us Brouwer's arrangements of seven Beatles songs for guitar and quartet. They are some of the most mellifluous middle-period ditties and Brouwer makes much of them. Hear his version of "She's Leaving Home" or "Eleanor Rigby" and you'll feel you've entered some enchanted territory. The album has that feel to it wall-to-wall, with some short works for guitar solo and duo, his sixth String Quartet, and his 1957 Quintet for Guitar and String Quartet. The compositions are luminous, a good sample of the composer's works yesterday and today, the artistry impeccable and ravishing. It's a glorious disk for all concerned, showing the Brouweresque impression-modern-pomo touch at its finest. Kudos for Barbosa-Lima and the Havana Quartet for their definitive performances. A knockout disk is what this is. Joana Sa put out a very absorbing CD/DVD Through the Looking Glass some time ago. I reviewed it on these pages (see 9/27/2011 posting) and found myself intrigued with the prepared piano composition/improvisation that the recording contained. She is back, this time in a collaboration with Luis Jose Martins they titled Almost A Song (ShhPuma 004). Ms. Sa is again on piano, and also toy piano, celesta, miscellaneous instruments and electronics. Luis contributes his vivid classical guitar approach, plus percussion and electronics. Joana's first album had a Cage-through-Stockhausen influence, within which she did some very creative work, following a path that ultimately led away from an avant orthodoxy (since everything established in time becomes an orthodoxy). 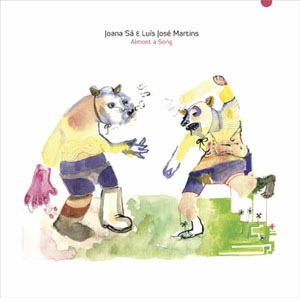 The new album finds Joana and Luis staking out territory that is a bit more "post-modern," presenting a series of improv-compositions that have avant jazz and minimalist reference points, very much in their own way. This is music operating at a high level of abstraction and interest. It is yet another compelling recent example of the avant jazz-new music nexus. The artists generally set up motival structures that they work through and vary as improv performances. Each piece has its own sound world, from dreamy-surreal to extroverted-impactful. Much of the music uses repetition and sonic structure forms as building blocks that then develop in loose, fascinating ways. It's marvelously mysterioso at times, bracingly invigoration at other times. Once you've heard this album more than once, you do not forget the music. It has originality and imagination, a haunting sensitivity toward mood creation and world-encompassing sound-painting. It's the sort of disk I would be inclined to put on for people to hear if they ask me "what's new and good," assuming they have had their ears prepared by modern jazz and classical previously. Composer Juan Sebastian Lach Lau hails from Mexico, but he tends more toward an international modernism than a local nationalism. 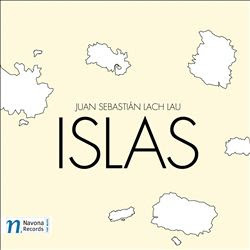 Either way he shows us some excellent examples of his music on the recent CD Islas (Navona 5894). The program varies in its requirements from solo percussion to larger chamber ensembles. He writes some excellent music for Salvatore Novello and an array of percussion instruments on "rzw + Continuidad Paralela," which is in the lineage of virtuoso, many stranded percussion sounds made part of our landscape by Cage, Varese and Stockhausen, but it has its own punctalism and landscaping. The percussion and computer trio "Pantaleon: the Electronic Hammer" has a many-colored pointillistic tapestry of sound in a somewhat "funkier" zone, with excellent efforts by Maestros Espinosa, Parra and Vega. "'round Ruby" for chamber ensemble is an exploded pointilized recomposition of Thelonius Monk's "Ruby My Dear," and what a nice way to do it!! Quite attractive and interesting music. Those are some highlights. One more larger chamber piece, a trio for bass clarinet, flute and piano, and a duet for clarinet and piano flesh out the program. They are also fine examples of Lach Lau's vigorus, creative brand of modern music. The Moravian Philharmonic Chamber Players under Jan Kucera or Vit Micka, Ensamble (sic or not sic) 3, Daniel Pastene on clarinet and Gabi Sultana on piano all put in excellent performances that do justice to the complex strains. This is a composer who needs to be heard. Thank you to Navona for putting Islas out. It's a must for modernist ears. May there be more to follow! 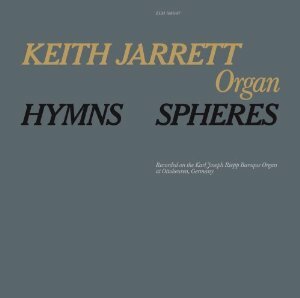 When Keith Jarrett recorded Hymns Spheres (ECM 1086/87 3716391) in 1976 on the Baroque Era Trinity Organ at the Benedictine Abbey Ottobeuren and it came out soon after, I bought it, appreciated it, but didn't think of what sort of ramifications it might have on the improvisation-classical nexus. In part that was because Keith was in such a creative phase and ECM was so prolific at the time with interesting music, I was riding the musical wave (so to speak) more then than thinking about where it was going. Looking back and listening again to the new fully restored complete work on 2-CDs (an earlier release on CD tried to fit all into one disk and had to cut some of the movements), I see how it gave the world a good reason why improvisation should be considered a wide-open opportunity for whatever a musician might imagine, something calling upon roots of earlier music, or jazz, or contemporary classical, or whatever else one might be hearing in one's head. And so it's been. Of course his solo piano concerts were and are a much more visible example of that. In those cases the identity of Mr. Jarrett is ordinarily so out front that there has been more imitation of what he actually does than perhaps a grasping of the new freedom from all stylistic constraints that were and are implied on an inspired evening. The truth is, a musical artist should be free to express the self as she or he sees fit. Is it jazz? This is not a question that holds meaning in the widest sense. Improvised music may be called jazz and may well be firmly in the jazz tradition. Then there are other ways to go, outside of the vocabulary developed in the past 100 years. This is what Keith Jarrett was doing especially well and especially profoundly on Hymns Spheres. It is music that by the nature of the instrument and Keith's response to it recalls sacred music from a long panorama of eras, beginning with the Baroque and climbing through the seminal French school of organists and so on. Bach, Franck, Widor, Tournemire, etc., all improvised a great deal on the organ. Most of the music is lost to us for obvious reasons--it wasn't until the recorded era that one could preserve it--but some of the compositions they wrote for solo organ showed the influence and feel of improvisatory practice. The point though is that Jarrett was not doing something earth-shatteringly new when he sat down to the Trinity Organ. But it spawned some exceptional music, even for Jarrett. The two Hymns and the nine-part Spheres finds Jarrett in a triumphantly melodic and mysteriously exploratory mood. He gets uncanny sounds from the old organ that still haunt. So perhaps that's all I will say about the newly re-released full set. It will appeal to the adventurous Jarrett jazz-side fans and anyone open to some beautifully ambient cathedral organ improvisations. It's a side of Keith Jarrett you do not see much of--a brilliant side nonetheless. And the recording spawned in part a continued interest in new music improvisation that we can trace up to the present. It is one of the many releases ECM and Manfred Eicher have presented to us in forwarding an improv-new music nexus. It is one of the very best. When a particular performance group cherishes clearly the music it plays, and they put their considerable talents toward making the music come alive, we most likely are the considerably richer for it. That is surely true of the Pacifica Quartet and their passion for the String Quartets of Dimitri Shostakovich. The third volume of their expansive treatment of Shostakovich and selected contemporaries, The Soviet Experience (Cedille 9000 138) is out, and it continues the high levels of idiomatic brilliance of the previous volumes. 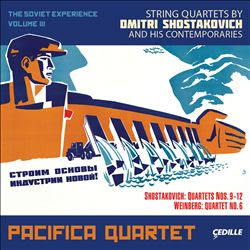 For the third volume Pacifica takes on Shostakovich's quartets 9-12, consummate modern masterpieces all, plus the 6th quartet of Mieczyslaw Weinberg, who is no stranger to these pages and fits in quite well with these later Shostakovich opuses. The volume fills two disks. These are masterpieces, played with passion, precision and a special knack for bringing out thematic highlights while still maintaining the contrapuntal complexities that make these works so attractive and vigorously bracing. I will not give a blow-by-blow description; you can find that in the liner notes. What I will say is that the Pacifica Quartet has done something seminal on this set. You would have to look very hard for a quartet that comes close to their mastery and excitement-generating enthusiasm for the music at hand. I believe there is one volume remaining? I will anticipate myself by asserting in advance that this will be the set of Shostakovich quartets to have. With the highly valuable addition of related Russian composers' work in the idiom, it takes the brass ring. Kaija Saariaho has given us an oratorio for soprano (Dawn Upshaw), choir (Tapiola Chamber Choir), and symphony orchestra (the Finnish Radio Symphony Orchestra, all under the direction of Esa-Pekka Salonen). The work is about the life-thoughts of philosopher activist Simone Weill (1909-1943). La Passion de Simone (Ondine ODE 1217-5) has an epic yet fully modern quality. It is a testament to the dramatic sense and sound-poetic acumen of the composer (b. 1952). And this recording feels like a definitive one--Upshaw, the chorus and orchestra, Salonen's interpretive enthusiasm and the sound production all make for an exceptional experience. I have not had a great deal of exposure to Saariaho and her work but most surely on the basis of this Passion she is one of the best of the living generations with us today. In any event La Passion has a depth of feeling and a sound painting brilliance virtually unmatched among those writing in the present century. This version says it with all the brilliance clearly before your ears. A masterful, highly charged atmospheric work that has the bite of Wozzeck, in a definitive performance? Yes, all that. High modernist classical, as anyone who is reading this no doubt knows, is an achievement unprecedented in the history of music. Never before has there been such use of expanded and deconstructed tonality, rhythmic complexity and unusual sound color. Happily for those who love it, it is still very much with us. 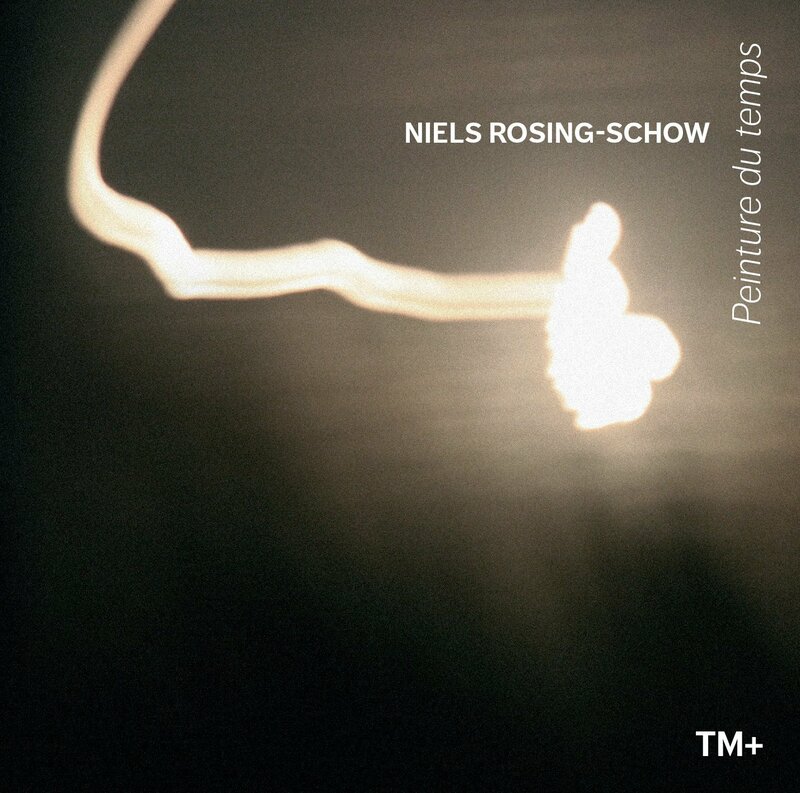 A brand-new example that is as involved and intricate as any of it that has gone before is Niels Rosing-Schow's Peinture du temps (DaCapo 8.226557) which includes the title piece and four other works, played with dedication by the ensemble TM+ under the direction of Laurent Cuniot. The size of the ensemble varies between an intimate duo setting of flute and cello for "Imprints of Time" to the fairly large chamber ensemble of "The Garden Behind the City." The pieces are mostly quite recent, ranging from a work composed in 1986 (and revised in 1997) to the nearly yesterday of 2010-11. Rosing-Schow's music is complex, atonal or nearly so, rhythmically very active, pointillistic in its own way and quite dramatically conceived. It's not a music that sounds at all derivative, but instead comes through in a voice that is quite original. The music goes from architectural strength to strength with a logic of sequence which is apparent and a classical-modern sense of inevitability. Rosing-Schow is a composer of the first rank and ensemble TM+ gives his music an ideal realization. Recommended. Most all important composers through time experience breakthroughs in the course of their output. It is rarely a matter of a long continuations production in a stylistic equilibrium. It is especially exciting when the breakthrough happens as you are hearing the music unfold, piece-by-piece, in real time. The Bang-on-a-Can composers Michael Gordon, David Lang and Julia Wolfe may well have broken through in their collaborative composition Shelter, which has just come out on CD (Cantaloupe 21083). It has a probing, insightful libretto by Deborah Artman. The work is performed with energy and care by Ensemble Signal under Brad Lubman with Martha Cluver, Mellissa Hughes and Caroline Shaw as the vocal soloists. The theme of the piece is the home, as conceived through time, as culminating in the American house. There are vocal refrains that describe a sort of evolution of attitudes one takes on entering a home in various cultures and periods. The libretto goes on in successive movements to enumerate the materials needed to build a typical house today, the evolution and de-volution of life on the porch, the impermanence of a dwelling over time, and some impressionistic imagery that relates to it all as experience. There is an apocalyptic feel to it. As in any good libretto that has a modern bent, it is in the context of the music that it all comes together, as sung lines in a musical universe that gives it totalized wholeness, if the work is to be effective. In this case it is definitely so. And so to the music: it is a captivating mix of modern, post-minimal, even rock-edged sounds with the three voices entering at critical points. Ensemble Signal is a 17-member chamber orchestra providing the instrumental parts. The electric guitar and bass have much to do with the metallic jolt one experiences at key points, but the score is quite a bit more than just jolt. There are contrasting sections of modern turbulence, expressive forward motion, suspended mysterioso qualities, some minimalist cycling of motifs at times and more else. Taken together as a total package it is triumphant, a work of significant depth, expressive power and singular form. The performance is exciting, the music essential, a sometimes disturbingly poignant impression of edginess, of suburban existence at the edge of its current possibility. 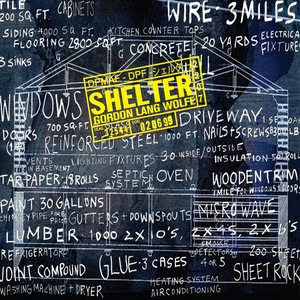 Maestros Gordon, Lang and Wolfe have created one of their most interesting works, ever. It may indeed define the downtown classical zeitgeist for many years to come. In any event it is an important work to hear for anyone who wants to keep up with the newest new music and where it may be going. 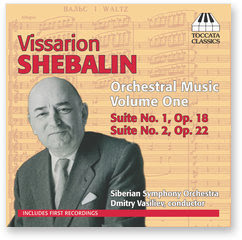 In the annals of 20th century composers Vissarion Shebalin (1902-63) does not fall towards the top of the well-known list. He was born in Siberia, got some attention and acclaim in Russia, was roundly condemned by the social realists in 1948 and had health problems for most of his later life. This may help to explain why he is not very well-known today in the States. You can hear some of his music on the recent Orchestral Music, Volume One (Toccata 0136). It's in the realm of somewhat light fare, in that it deals with his incidental theater music, put into concert performance shape as two Orchestral Suites: No. 1, Op. 18 (1934-36) and No. 2, Op. 22 (1962). No. 1 enjoys its first recording here; No. 2 gets its first CD recording. What it shows us is that Shebalin has some progressive traces in the earlier suite, not so much in the latter. He is a melodist of talent and an orchestrator who knew his craft. The first suite grabs me a bit more than the second, which seems a little more generic as a whole. The Siberian Symphony Orchestra under Dmitry Vasiliev do a decent job with the music. If it doesn't do a great deal for me, I can only assume that this is not the place to start in appreciating his artistry. There are symphonies and other more serious works and I can assume we'll be hearing from Toccata Classics in the near future with more in the heavier vein. It's nice enough and shows that Shebalin is no featherweight, but perhaps may not be essential to all but devoted Russophiles. Heitor Villa-Lobos, Symphony No. 3 "War," Symphony No. 4 "Victory"
Heitor Villa-Lobos (1887-1959) was off to a very promising start when at age 22 the Government of Brazil commissioned him to write two symphonies commemorating the country's involvement in WWI. What they got can be heard to full advantage on the Sao Paulo Symphony Orchestra recording, conducted by Isaac Karabtchevsky, of Symphony No. 3 "War" and Symphony No. 4 "Victory" (Naxos 8.573151). These are two very original, mature works that avoid the glib "hurrahs" and "attaboys" that a lesser composer might have been tempted to include. Instead we get complex orchestral tapestries of mystery and elegaic respect. Villa-Lobos had already developed the soaringly rhapsodic aspect of his symphonic style, somehow more Brazilian than romantic. You can hear it throughout both works. And there are also sound color, orchestrational touches that with the large orchestral forces at his disposal, combine with the melodic sweep to make the two symphonies stand out as singular. The performances are strong, the recording sounds quite good; we are given spirited readings of two scores that deserved to be heard more widely. Villa-Lobos is such an important part of the 20th century melange of innovators and here we have two excellent early reasons why that is so. Highly recommended, especially at the Naxos price! All music in some sense is an answer to a particular set of usually unstated questions. I presume those questions change over time and style sets, for music can be quite variable as we know and different composers-artists at different periods of time can be operating under very different premises compared to some other contrasting period. Or so it seems when taken as a whole. When one is dealing with "new music," things thought-through very or relatively recently, it may be that the world has not quite caught up with what the artist is saying. Or perhaps the audience is there already but the ideas behind the music have yet to be made fully articulate. Not all music is only understandable by people in some future era, and not every era has universal population coverage for a style of "serious" music, if that ever can be said. 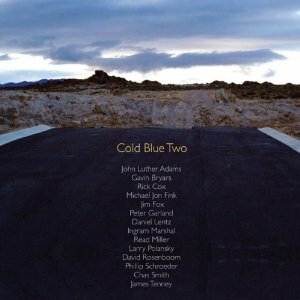 Be all that as it may, it hit me as I have been listening to the new anthology Cold Blue Two (Cold Blue Music 0036) that we may be experiencing a shift in the parameters, and the unstated questions lurking behind some new music today. If so, it is as a subset of the modern world, not as a total supplanting of it, as far as I can hear. The music is not entirely post-modern, in other words, because it exists within, presumes, and in part assumes the "today" of modernity. Certainly the 14 relatively brief compositions by the 14 composers represented in this collection have something in common. There is tonality, yes, and there can be a certain cyclical use of motifs, though not always for the latter. The fourteen previously unreleased recorded works are not typically "modern" for the most part in the strident sense, nor are they heroically expressive in the neo-romantic sense. It's music somehow more intimate, personal, lived-inside. Beauty seems to be a concern, for there is a constant kind of tenderness that feels like that throughout. There is also a range of expression but most certainly within that range a bit of melancholy, of contemplation, sometimes a plain-spun kind of naivete, and a sensuous attention to tone without the lushly gushed version that romanticism proffers. This is music with a cinematic quality. It has a calling-up-of-imagery sense to it. These are soundtracks to a life being lived at the moment, perhaps. The pieces range from solo piano to chamber ensembles of small-to-medium-small proportions, with and without electronic enhancements. The composers involved are sometimes pretty well-known--Gavin Bryars, Daniel Lentz, James Tenney, and there are somewhat lesser known ones as well--John Luther Adams, Rick Cox, Michael Jon Fink, Jim Fox, Peter Garland, Ingram Marshall, Read Miller, Larry Polansky, David Rosenboom, Phillip Schroeder, Chas Smith. Performers are all quite up on the music and range from the well known ETHEL and Guy Klusevsek to the composers themselves. All sound right and present themselves to us with excellent fidelity. The music consistently engages and remains quite accessible without straying at all toward a new-age dumbed-down faux populism. That's quite refreshing. There's so much in the way of variation within this overall mind-heart-set that I will not try to encapsulate the myriad particulars. So then what is the unstated question that motivates this music? I am not sure that words do justice to it or if there is enough space to go into it fully. But I will say that "how does it feel to be alive right now?" may be a part of it all. It's not as much about concept and carving new syntaxes that we might hear and sense in new music from later romanticism, the Darmstadt-Cagean and high minimalism forms of classical that are all very much still with us. This music seems different. An extension of folk-nationalism in a way but without necessarily being specific as to which folk and which nation? Perhaps. At any rate it is music that communicates and shows a most definite human face. It's not so much about technology and technique as it is about how it is like inside the technology, in spite of technology, with perhaps a bit of nostalgia and striving after the simpler forms of a pre-technical existence. I could be wrong about all that. The main thing however is that this is singular music. Highly recommended.